We are pleased that you are a part of BHN Group. It is our desire that we establish a sound working relationship based on trust and cooperation. To accomplish this, it is important for you to know, understand, and follow established rules and policies that affect you and help keep BHN Group strong. Accident prevention and safety are high priority items with BHN Group. You will be expected to read and become knowledgeable about the following Company safety policies and work rules. BHN Group prohibits the illegal use, possession, transportation, or sale of drugs and the unauthorized use of alcoholic beverages, firearms, or explosives during work hours. Company employees must not report for duty under the influence of any drug, alcoholic beverage, intoxicant, or other substance, including legally prescribed drugs and medicines, which will in any way affect work ability, alertness, coordination, response, or risk the safety of fellow workers or the general public. During the course of your employment, you are subject to inspection for possession or use of unauthorized materials such as alcohol, drugs, or firearms as required by our policies or those of companies with which we do business. Your entry into or presence on Company work sites, vehicles, or owned property is conditioned on the Company's right to search any employee's property, including lunch boxes, lockers, bags, and private vehicles (including trunks, glove compartments, etc.). By entering into or being present on Company controlled or provided work sites, vehicles or owned property, any person is deemed to have consented to such searches which may include periodic and unannounced searches of anyone while on, entering, or leaving such facilities. This is a condition of employment. These searches may include the use of electric or electronic detection devices, scent-trained animals, or the taking of blood or urine samples for testing to determine the presence of substances prohibited by this policy. The Company will pay for the full cost of any tests and transportation to and from such tests. If you chose not to consent to the search or medical testing, you are subject to discipline up to and including suspension or termination based upon observable symptoms or any other information. All searches will be conducted in the presence of BHN Group representatives. As a part of BHN Group you are expected to maintain your internal and external work relationships in a professional manner. Good faith compliance with applicable laws, rules and regulations is expected. BHN Group is committed to protecting the environment from all forms and types of pollution caused by its activities. On board, the Company implements good working practices to ensure a safe, secure and healthy working environment. It pro-actively implements a Drug and Alcohol Policy for all seafarers, that includes testing and screening during pre-joining medical examinations. Additionally, co-operation with Custom authorities worldwide is maintained to combat illegal drug trafficking through the signing of Memorandum of Understanding. 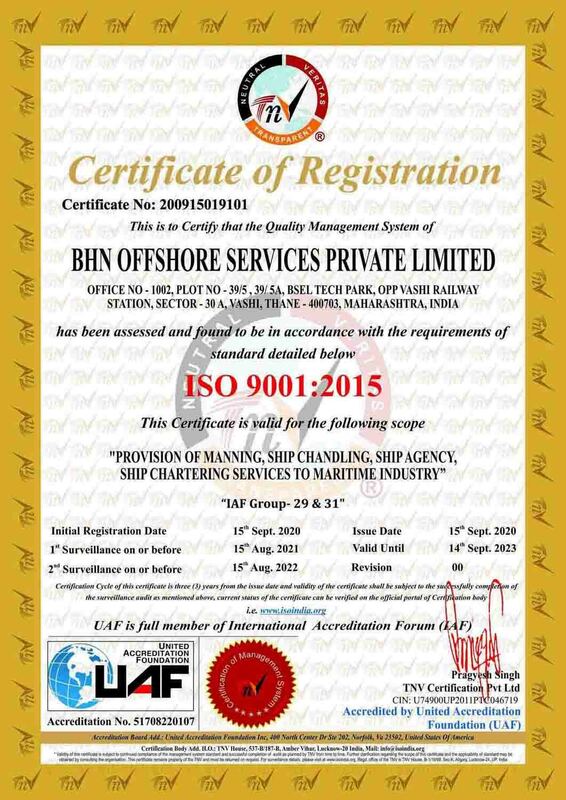 BHN Group policies on safety and environment protection are constantly being reviewed and updated to fully comply with international standards at all levels within the organization. This summary does not and is not intended to cover all applicable policies. It is only a guide to give employees management opinions on several areas. Even though this may seem like a large amount of information, it is important that this information does not go unsaid. We believe it is your right to have these rules expressed to you, to know what is expected of you, and to know how BHN Group manages its business. These policies represent good business and personal ethics that form the foundation of this organization.